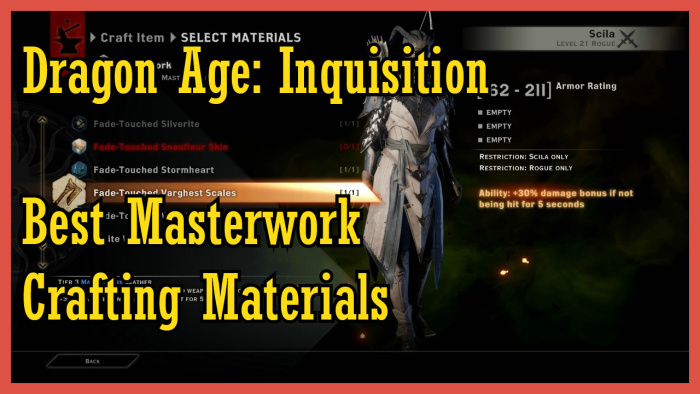 You can then use these materials to fill the Masterwork slot in a crafted weapon or armor piece for powerful bonuses. There are 3 tiers of Masterwork materials – the higher tiers are found from higher lever areas / higher level monsters. Note: some Masterwork materials can have different versions (Snofleur skin, for example, can either heal 1% maximum health on attack ,or give you a chance to cast Horn of Valor). Masterwork crafting materials are a great way to not only make your crafted gear a lot more powerful, but also add cool effects to your attacks. And in some cases, they can even make or break your character’s build – as in the case of Reaver specialization warriors using the Guard on Hit masterwork. But with so many choices, what are the BEST masterwork options? There’s no question that this is the best fade-touched masterwork material. You gain +5 guard with any attack (including spells) which is a massive survivability boost to any character, especially melee. My Reaver warrior and Assassin rogue went from chugging potions and constantly dying to surviving with no problem once I crafted an armor peice with Fade-Touched Silverite for them. Best used by: Any character will survive a lot easier with this masterwork, although it is more important for melee. Where to farm it: Fade-Touched Silverite has a small chance to drop from normal Silverite ore deposits. The best place I’ve found is the dragon area in Emprise Du Lion (past the broken bridge that you repair with a war table mission), around the Highland Ravager dragon in the Pools of the Sun, and slightly to the south. You can either save the game before you loot the Silverite, and then keep reloading the game until you get a fade-touched one, or travel to another world area, and then come back and the Silverite will respawn. The Hidden Blades effect in action – copies of your character rapidly attack your target. This is arguably the best and most fun Fade-touched masterwork for pure damage, allowing you to cast the Hidden Blades ability, dealing roughly 500% weapon damage in total whenever it procs. This effect is vastly superior to other spell-proc masterworks. Best used by: Melee or ranged characters with high attack speed or abilities that cause multiple attacks (like the mage’s Energy Barrage). Where to farm it: Drop from Red Templars anywhere in Hissing Wastes or Emprise Du Lion. I prefer to farm it from a group of Templars that spawn north-east of the Tower Camp in Emprise – you can save the game before fighting them, and then simply reload if the Fade-Touched Velvet didn’t drop. Despite being a tier 2 material, the Fade-touched Bloodstone is actually very, very good. It is essentially a flat damage boost for every enemy that is within 8 meters of your character, which means you will always have AT LEAST 7.5% extra damage. Best used by: I would choose this over Hidden Blades for melee characters with slow attack speed, like warriors and Knight-Enchanter mages. Where to farm it: My favorite area is near the Riverwatch camp in northwest Exalted Plains. Simply travel to the camp, and either save before looting the ore and reload until you get the Fade-touched version, or loot all of it and travel to a different zone and come back again. Although this masterwork material is difficult to farm, it is very powerful for ranged characters. A 30% damage bonus is massive as long as you don’t get hit for 5 seconds. Where to farm it: This has proven to be the most elusive Masterwork material. Not only are Varghests themselves rare, but they also don’t seem to be dropping the item at all (or at least not the tier 3 version). This masterwork has been recently fixed and renamed, and drops from Gurn, the rhinoceros-looking things in the Hissing Wastes. Best used by: DPS-oriented Ranged characters (archers or mages) as they shouldn’t be getting hit that often. This masterwork is deceptively powerful – it casts a Horn of Valor (warrior skill) which gives you 15% attack and armor bonus. At first, it doesn’t look like it will match up with some of other DPS materials on this list, but you have to consider the fact that it is an AOE bonus – so it can apply to your entire party! And if you put it on a character with high attack speed (like a rogue), then you will have Horn of Valor up almost all of the time. I highly suggest putting this masterwork on any one character, so that you get the benefits for your whole party. Where to farm it: Drops off Snoufluers in Emprise Du Lion and Exalted Plains. The best spot I found is on the frozen lake in northern Emprise Du Lion. Best used by: This really depends on your party make-up. If your party has a lot of melee characters, I would put this on a DPS rogue or a warrior. If your party has 3 ranged, I would probably put it on a ranged character. The idea is to have as many members of your party affected by the Horn of Valor whenever it procs. This masterwork is a great addition for a mage character that is limited by mana pool rather than cooldown periods. I particularly like this masterwork on Necromancers, and builds that use a lot of lightning spells, since they have a high mana cost. Where to farm it: Off Venatori in the Hissing Wastes. Best used by: Mage builds that are very mana-intensive. As a final note, putting two of the same Masterwork on one character does not make it stack. 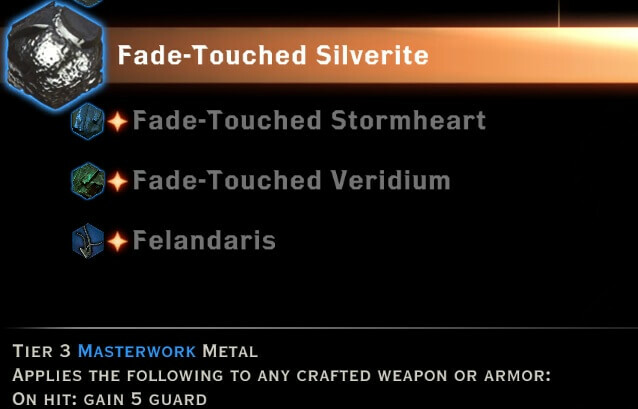 So if you put 2 Fade-Touched Silverites on your warrior’s gear, for example, you won’t get any added benefit – you will still only generate +5 guard on hit. However, the same masterwork effect of a different tier DOES stack – for example, you can pair Fade-Touched Silverite (+5 guard on hit) and Fade-Touched Obsidian (+3 guard on hit) on the same character, for a total of +8 guard on hit. I see no reason why Fade-Touched Stormheart shouldn’t be on this list. Especially for ranged characters and especially for Knight Enchanters or mages in general. The extra 30% attack is definitely worth it. All you need to ensure is that you have a semi-decent tank, ie Blackwall. You don’t even need to go all out in building him up. So long as you take the skills that generate aggro, then there is never really a time in which you would be the main focus of any enemy. And on the very rare occurrences that you are, there are ways to mitigate that. KE has the automatic 30% of damage barrier buff, you could also wear a Ring of Doubt that makes you invisible when not attacking in combat. Mix that with Fade Step and there should be no reason for worry. Rogues can also evade and go invisible, so again even with Rogues there is no real cause for concern, melee would be the only real reason that you’d not want to have a berserk masterwork. I’m currently playing my 4th playthrough on a custom game. Hard Mode with Even Ground and Walk Softly trails both activated. I’m barely half-way through the story (last story mission I completed was Wicked Eyes, Wicked Hearts for the Trial of the Lovers trophy). I’m level 27 and I am wearing Andraste’s Sacrifice which does taunt all enemies within 8 meters for 4 seconds…even with all of that, I am rarely if ever attacked by enemies, because Blackwall is an unkillable tank god! Therefore, Berserk is probably (in my opinion) the 2nd most OP and most useful damage masterwork in the game next to Fade-Touched Plush Fustian Velvet (Hidden Blades). 3 years late to the party since the last post, but I thought I’d add my two cents as well. I’m partial to the fade touched dawnstone, silverite, and plush whatever velvet for walking fortress, guard, and hidden blades. It leaves my rogue assassin pretty much untouchable. In redcliff village in the hinterlands their is a deft hands door chest that will always contain fade touched obsidian. Hope this helps someone. So I’m just wondering does anyone know if farming fade touched iron is possible? I am not quite sure where I found it but it adds like 103 to max health when I use it. If anyone can answer this thank you!! I’d imagine it works just like farming any other ore – find a spot with a bunch of iron nodes, save your game before looting, and reload until you loot one that is fade touched. Per the wiki, Iron can be found in Hinterlands, Crestwood and on the Storm Coast. Not sure how alive this post is right now but I hope someone sees this. For masterwork materials I’ve been trying to find out if when the masterwork triggers if it will benefit from a skill tree upgrade. Such as a assasin rogue with the “No Witnesses” hidden blades ability that procs a hidden blade masterwork will the prof have the “No Witnesses” effect. It might be best to test this on Snofleur Skin, because Guard Generation is very noticeable compared to other upgrades. 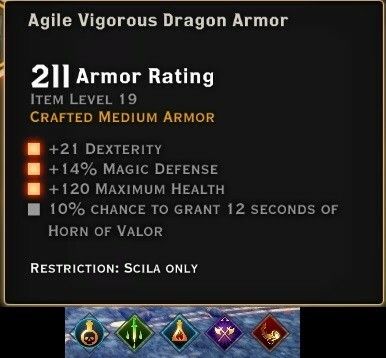 A little question.does skill horn of valor stacks with effect on weapon/armor? So, with some recent patch, the Gurn / Vargherest scale issue has been corrected, but the materials dropped were just renamed. So, now the Fade-Touched Hardened Gurn Hide is 30% damage if not hit for 5 seconds. So, keep farming the Gurn.. it drops very seldomly, but does drop. So will I only need one Fade-touched Silverite for some armor or will I need a lot? Only 1 since the same masterwork will not stack. But you can get a different tier to go along with it, like the + 3 obsidian version. Fade-touched Silverite (the +5 Guard) used to be pretty convenient, but nowadays wouldn’t be the best option for the hardest content. 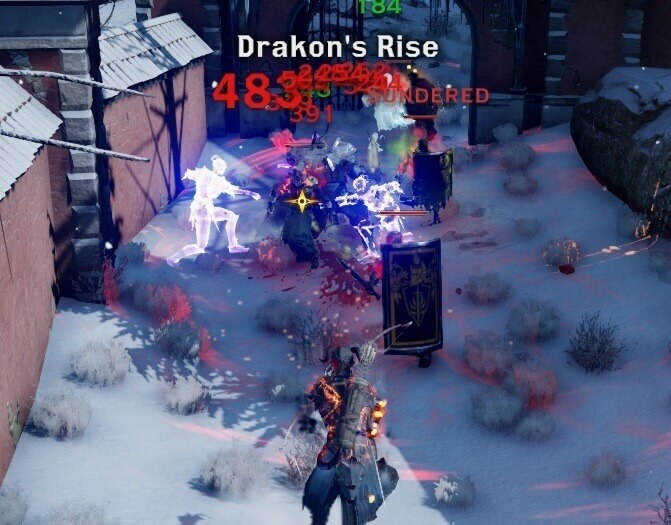 The Jaws of Hakkon DLC first introduced enemies that (on nightmare mode) can “one-shot” rogues and mages even with max barrier, max guard, and max health all at once. After Trespasser, the value of FT Silverite became more questionable because the Horn of Valor skill received an upgrade that permits guard generation of allies, and the Encore buff permits party members to heal on hit. Furthermore, if playing under Nightmare + all trials, the archers and rogues in the Frostback basin can definitely one-shot you if promoted to elite. Currently, for mages, I believe that FT Dawnstone (5 sec. walking fortress) + FT Royale Sea Silk (fade cloak cast) is most preferable for the hardest content, since this configuration will permit you to survive all spike damages in the Frostback Basin. Also, Fade-Touched Plush Fustian Velvet (5 hit hidden blade) isn’t as good as it looks for mages, because staves have very low base weapon damage. Instead of base damage, mages rely mostly on either (1) the damage multiplier on skill attacks (from which hidden blades do not benefit), or (2) multi-hitting AOE/auto-target skills (hidden blades can only proc when the current hidden blades has finished, so every AOE hit when blades are active cannot be further proc’ed to damage). For mages, the +10% stat masterwork will likely outperform the 5-hit hidden blades for any situation that involves large crowds. The +10% is more like +15%, since it also raises the stats on your weapon other than the base damage. Did the stats for the fade touched silverite change? because mine says 10% chance lightning damage. This is bumbling a thread that hasn’t seen any action since January so I hope I’m not breaking any rules… but been thinking about stacking the masterworks that give 25 and 75 % movement speed boost when in stealth. Has anyone tried this and confirmed they follow the dual tier rule and stack? A question….could you also make a guide for armor/parts crafting? Fade-touched Lurker Scales is also extremely awesome. 10% chance to cast VEIL STRIKE on hit. I’ve been using it on the staff of my inquisitor and it’s ridiculous how good it is. More so because it seems like every single bolt from energy barrage qualifies as a separate hit, so every time I cast energy barrage, I also almost always cast veil strike. And veil strike itself is powerful. It knocks down humanoid enemies and stuns almost everyone else.And it’s AREA EFFECT, meaning it also affects everyone near the enemy being hit. Can you please tell me why your favourite place to farm Fade-Touched Bloodstone is the Riverwatch camp? Is it because you’ve found it drops from that spot more? I would have thought Emprise Du Lion would have been the better choice seeing as there’s so much more bloodstone around. That is correct that is the best place. Why? because that is where you also farm snowfleurs so 2 birds 1 stone. you get the 1% heal on hit, the fade touched bloodstone, plus the snowfleur drops which equals up to 20k an hour. Hi nathonas, have u ever found a fade touched vaghest scale 30% damage? almost a week that I’m killing a group of Gurns in Hissing (south of logging camp) and reloading if they didn’t drop the item and since now not even one fade touched material dropped. Any advice? Cool thread man. Keep up the good work. I do have a question… Ive been doing research trying to find out if critical percentage caps at 100%. Ive been getting mixed reviews as to if this is true or not. I was wondering if you knew would you be able to give a definite answer on this subject. Again, nice work! Hey yoshighomi, I would imagine critical strike chance caps at 100% because there’s no point in anything beyond 100%. edit: checked in game, Critical damage bonus has no cap. does it matter if you use fade-touched masterwork on a weapon or on a piece of armor for the proc to occur? For instance, if i have horn of valor on my armor or on my weapon, would it proc on BEING hit or on HITTING? It doesn’t matter if you put a masterwork on armor or weapon – it will still work the same way. As for how to activate a given effect, it all depends on the particular masterwork. The Horn of Valor one is a bit misleading because it doesn’t say how the 10% proc works, but I know from testing that it only works when you hit something. Most Masterworks are pretty clear on how they work though. Sry applied to the base damage of the weapon. As in if my bow does 100 damage per shot it will now do 130 so if I do long shot is it’s damage is based on the 130 or a extra 30% tacked on the end? I think that’s the way it’s supposed to work – making your weapon do 30% more weapon damage, and as a result making all your skills hit 30% harder. But now that you menetion it, I tried testing it out and I couldn’t see the 30% damage increase at all. Looks like the bonus may be bugged right now. It’s a bit difficult to tell because my archer’s damage is all over the place. any chance for a clarification of the last paragraph regarding stacking masterwork materials? Sure – if you take the exact same masterwork material and put it on the same character, then you won’t get any added benefit. So let’s say if you put Fade-Touched Silverite on a warrior’s weapon, and also on the armor piece, you will still only have +5 guard every time you attack. However, if you use a Fade-Touched Obsidian (Tier 2 version of the same effect, which gives +3 guard instead of 5) along with Fade-Touched Silverite, then they will add up and you will get +8 guard every time you attack.